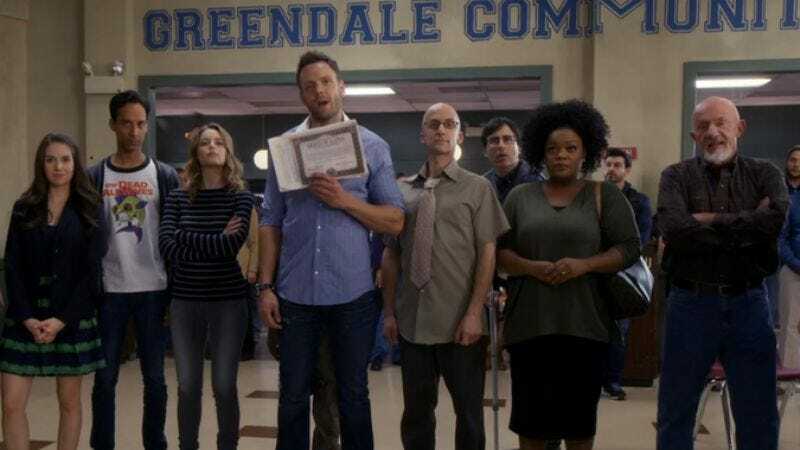 Community will get its sixth season after all—this time on the Internet, where the show has always lived anyway. Yahoo is the series’ digital savior, stepping in where the likes of Hulu were too afraid to tread, and using the built-in workings of the recently canceled NBC show to ease its own foray into streaming original programming. It’s now made a deal with Sony to bring at least 13 episodes to the digital air this fall, so that Community can at last fulfill its “six seasons a movie” mandate, provided Dan Harmon actually goes through with his vow to make the latter in his basement if he has to. To celebrate Community being saved by the Internet, you might consider, just this one time, posting Community quotes on the Internet.